The trouble with placebos is that they work. They shouldn’t. Placebos … a harmless sugar pill given that patients are told it is an actual drug … have a long track record of curing, healing, and improving the lives of patients. Often a bigger track record than the actual drugs themselves. Placebos work. They shouldn’t. We don’t know why they do. We have a better idea, however, of how they don’t work. 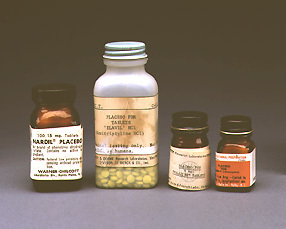 Much previous research with placebos was based on the idea of deception – that doctors were lying to patients to convince them that the placebo was a real drug. Recent research suggests that’s not the case. A team of leading placebo researchers from the Harvard Medical School’s Osher Research Center and Beth Israel Deaconess Medical Center looked at the effectiveness of placebos pills on patients who knew they were taking placebos. The study was published in the December 22 issue of PLoS ONE. It turns out that letting patients in on the “secret” had very little impact on the effectiveness of the placebo. The study involved 80 patients who were currently diagnosed with IBS (Irritable Bowel Syndrome). One group received no treatment while the other group was told to take sugar pills twice daily. The researchers made it clear to participants that these were really sugar pills with no active ingredients. They also told the patients that they could participate even if they didn’t believe in the placebo effect. At the end of the three week trial 59% on the placebo pills reported they had relief from their IBS symptoms vs. the 35% of those not on the placebo pill who reported feeling better. The great news is that those that were on the placebo pill had a level of improved health that was comparable to treatment with the more powerful IBS medications on the market. This isn’t the first time placebos have been found to be as effective as active medication. One of researchers that participated in this study is Irving Kirsch, the author of “The Emperor’s New Drug: Exploding the Antidepressant Myth” published in 2010. In this recent book, Kirsch looked at 38 published double blind clinical trials of anti-depressants where the patient and doctor don’t know who is on the placebo. He found that 75% of the antidepressant effect was produced by the placebos as well. One is tempted to say that the placebo effect was caused by the extra attention a placebo recipient receives from their doctor – but the study suggests that isn’t the case either. In this research study the no-placebo group received the same level of compassionate care that the placebo group received. The outcome was not related to how compassionate the physician was; it looks like the outcome was due to the pill. Even though the pill does nothing. However, upon consideration, the placebo group had additional help. That help came in the form of their belief in the power of the pill. With more and more drugs coming out that are advertised as being helpful for what ails ya’ it shouldn’t be too much of a surprise to see that pills … in whatever form … are a kind of sacred object. Dare we propose that some of us react to pills like the unfortunate dogs in Pavlov’s experiment? We could propose it, but it’s probably not that simple. The mind body connection is definitely evident here. Placebo research shows that what we believe can be connected to the success or failure of treatment. With the upsurge in direct to consumer advertising, the “pill” has become the dominant form of most treatments. The same effect could be developed if the medical field actually supported alternatives that were not just pill treatments … treatments that are generally more effective. Prescriptions could go beyond the pill and include recommendations that include mind-body work. Kirsch recommends that in the case of depression alternative treatments such as therapy or exercise. While it’s not the only factor in play, the physician and patient relationship is still very strong and further research could also look into how this impacts the outcome of placebo based treatment. Perhaps the next question should be: when a doctor hands a patient a pill what part of their psyche is activated that may have an impact on whether or not the pill works? As Carl Rogers repeatedly expressed, humans have a natural drive towards health. The work of the therapist, doctor, healer is to provide the rich environment for that to happen.